Whenever you think of migrants arriving in Europe, think of this image. You may or may not have seen this image on Facebook or Twitter in recent days, by freelance photographer Daniel Etter for the New York Times. 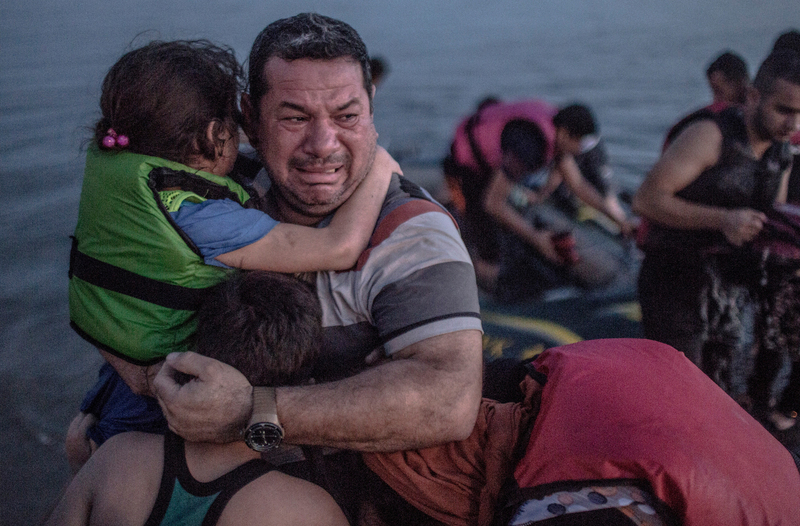 It depicts a Syrian refugee from Deir Ezzor, in tears while holding his son and daughter after arriving on the island of Kos in Greece, on 15 August. He and his family had travelled on a flimsy inflatable boat carrying around 15 men, women and children. After more than two hours of driving the boat had lost air, water had leaked into it, the refugees were soaked when they arrived at the shore. They were then completely relieved to have arrived safely. In that moment, it all came at them together, the joy of having done it; the love for their family; the grief over what had happened. The image has provoked an emotional reaction from thousands of people online and social media users are sharing the picture to counter people’s perceptions of migrants. The UN reports that the number of refugees and migrants arriving in Greece is accelerating dramatically, having passed the 160,000 mark for the year. The number of sea arrivals in Greece from 1 January to 14 August 2015 was 158,456 and the number through the land border with Turkey was 1,716, taking the total to 160,172. Last week, a total of 20,843 people arrived by sea in Greece, 82 percent of which were from Syria, 14 percent were Afghans and 3 percent were Iraqis. The UN says that the overwhelming majority of these people are likely to qualify for refugee status. The total number of refugees and migrants crossing the Mediterranean this year so far is 264,500, 158,456 of which are to Greece, approximately 104,000 to Italy, 1,953 to Spain and 94 to Malta. Sometimes the numbers don’t quite get across the scale of the human tragedy involved, however. But this photo does. ← @yourfive by AJ Heath.